Happy New Year! My brother was going to Sucat on New Year's Day and my sister was just too bored to stay at home that she wanted to go out and eat. That's when I suggested to have dinner somewhere along BF after we accompany our brother to Sucat, and everyone's okay with that. My sister was too quick and excited to suggest that we eat at Meat Depot. It's been awhile since we last went here. Also, my brother hasn't tried it yet so he was also thrilled. We got to the restaurant and it wasn't too packed like before. It might be because they've expanded their store compared to the last time I've been here. 1. First step, we chose our meats. My brother and sister each got the rib eye while I got the striploin. 2. Second step, fill out the "order form" (small sheet of paper) that specifies how you like your meat done, the side you want to have, the sauce, and the drinks you want. After roughly 15 minutes, our steaks were served. Well, I honestly think that the steak was better before. 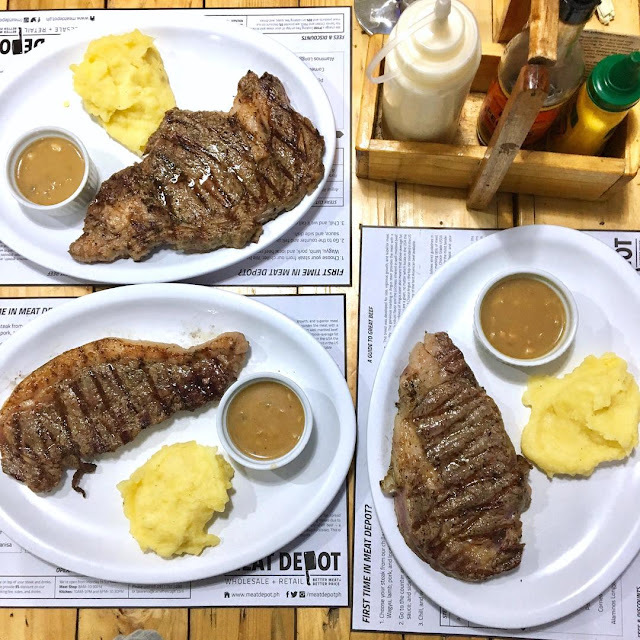 When I first tried Meat Depot, the steak was more flavorful and cooked right. You'll notice it from the color of the cooked steak alone. But it's still good now. However, I think they have been having troubles with the doneness of their meat. This was what my brother hated. He had his steak done medium rare but it was more of rare. Mine was supposed to be well done but some parts of it were medium well and others were just medium. I knew this was going to happen that's why I had it cooked well done. The mashed potato was more like a sweet potato than a potato. It was a bit sweet and the texture when eaten was different. For the sauce, we all chose the mushroom sauce. This one has always been my favorite. Overall, it's just sad that my brother didn't appreciate his experience here. Although I can say that Meat Depot is still a good place to run to when craving for some huge and cheap steaks. Their pricing is just hard to beat, even with the cooking charge. P.S. I was supposed to have their salmon or tuna but they didn't have them that night.